This is what a 3-story, mixed-used building proposed by 3M Capital Trust LLC would look like on Cross Street in New Canaan, Conn., as seen from the Cherry Street intersection. The Planning and Zoning Commission has approved requests to amend the town's zoning regulations following a revised application to build a mixed-use development at 16 Cross St. The team representing the developer, 3M Capital Trust LLC, made changes to the project last week after input from residents, commissioners and consultants. "We've heard the message and we redesigned the project," Stephen Finn, an attorney representing the applicant, said at the third part of a public hearing on the proposal Monday night. The new plan calls for construction of a three-story building, as opposed to 3.5 stories initially proposed. The new plan also would have 10 two-bedroom units and two studios, as opposed to 14 total residential units. The developer also is no longer seeking a text amendment for shared parking. The proposed building would also have 54 parking spaces and would encompass about 7,000 square feet of commercial space on the first floor with residential units on the second and floors. 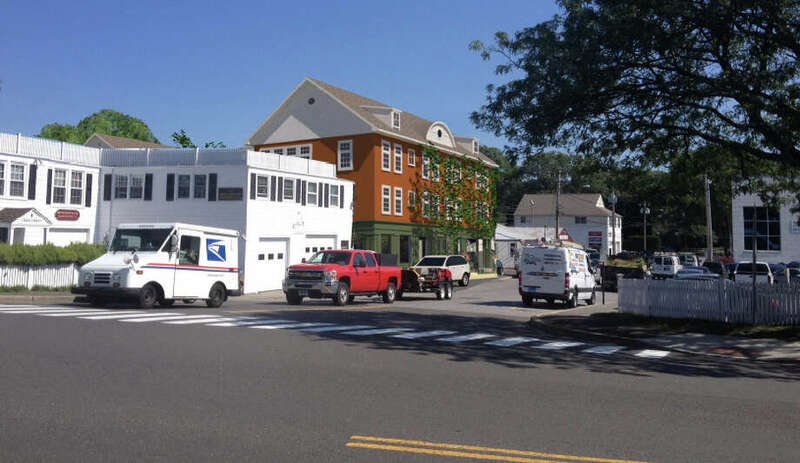 About 3,500 square feet would be reserved for an anchor tenant, which the developer hopes to be the New Canaan Post Office. The LLC principal -- Arnold Karp, of Karp Associates -- has repeatedly told the commission that he'd like to have the post office there, but Postal Service officials said they would not choose a site where the mail truck has to back up to and from the building. Karp, however, said he hopes they would reconsider that decision. "Once we got a building in formation we'll try to sit down with them," he said. In order for the project to be considered by the P&Z, however, Karp was seeking multiple amendments to the town's zoning regulations. The commission voted unanimously to approve the text changes, but kept open the hearing on the site plan. The next P&Z meeting is scheduled for Tuesday, Dec. 16. The text changes are effective Dec. 15. Resident Andrea Sandor and her attorney Caleb Hamel said such text amendments would violate a 2013 ruling by the Connecticut Appellate Court in MacKenzie v. Town of Monroe, which stated that case-by-case zoning variances can only be granted by the Zoning Board of Appeals. In that case, Monroe's Planning and Zoning Commission rezoned a McDonald's property from a residential and farming district to a business district to accommodate the fast-food restaurant's special permit requests. Attorney Peter Gelderman, of Berchem Moses & Devlin, a law firm representing the town, said Monday the text changes sought for the Cross Street area do not correspond with those in the MacKenzie case. "I don't think these regulations run afoul of that decision," he said. "MacKenzie does not, by any stretch, take away the commission's ability to grant special permits." What MacKenzie said, Gelderman told the commission, is that P&Z "can't give itself the power to vary its own regulations," but it didn't say that the panel doesn't have the right to grant special permits. "In fact, that's a specific statutory right that you have," he said. As he did in the first two parts of the public hearing, Finn quoted the recently adopted Plan of Conservation and Development to support his client's proposal. "You should be more than satisfied that this is a good project for the town of New Canaan," he said. In defense of the text amendments, Commissioner John Goodwin said the project poses no risk to the health or safety of the neighbors and would be a "potential enhancement to property values."